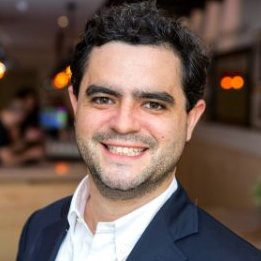 Andoni Goicoechea is a Venezuelan serial entrepreneur. He founded his first business at 16. At 26, he graduated from medical school at Universidad Central de Venezuela in Caracas (his hometown) and sold the side hustle before moving to Madrid to seek opportunities beyond the political instability at home. Andoni began his geriatrics residency at Hospital Universitario La Paz and had settled into his local routine when his neighborhood bar shut its doors. As so many businesses across the country, the bar had failed to stay afloat in Spain’s sinking economy. Tempted by the low rent for prime real estate (the bar was right next to a popular business school with heavy pedestrian traffic), Andoni decided to rent the space. Soon after Andoni launched there the first Goiko Grill as a burger and sandwich venue, but quickly pivoted to focus exclusively on burgers. Locals loved the burger concept and it catered directly to the growing popularity of burger joints across Europe. Andoni quit his residency to open a second location in Madrid in 2014. Goiko Grill, founded in 2013 by Andoni Goicoechea, is a Spanish hamburger chain known for its delicious products, honest brand, great atmosphere, and community engagement. Most notably, Goiko Grill engages local social media influencers before launching in a new city in order to attract buzz and potential hires that are dedicated to the brand. Spaniards across the country know they can count on Goiko for a great burger and a great experience. With 23 restaurants today, the brand plans to expand to over 60 locations within the next two years.